In our previous WordPress tutorial, we learned how to edit and add text to pages and blog posts. Here we will learn how to add images and embed YouTube videos to any page, using WordPress. Adding images to blog posts or WordPress pages is a simple, 3 step process. Start by accessing your page and clicking the ‘edit’ button. Step 1: Click your mouse pointer to the area of the page you would like to embed an image. Step 2: Click the ‘add media’ button, located above your page edit toolbar. This will open the ‘insert media’ page where you can choose from several options, such as adding an image from your existing image library or uploading a new image from your computer. (You can even embed an image from elsewhere on the web by selecting the ‘insert from URL’ option). Regardless of where you are grabbing the image from, select it by clicking the image thumbnail, shown in the image library area. Before clicking the ‘insert into page’ button, you will want to review several options, such as size, alignment and what the image links to, such as another URL (link). You can select ‘media file’ which enables a clickable link to a full size image or ‘none’ which will disable the link altogether. Once you’ve configured the image settings, click the ‘insert into page’ button on the bottom, right. Step 3: Your image should now be visible on the page. Click the preview button (top, right) to catch a glimpse of the layout so far. If you’re happy with the page, go ahead and click the ‘update’ button. If you need to make additional edits to your image, find the image (in the visual edit tab) and click on it. After clicking the image, you can manually resize it by dragging the outer margins to the desired size. Clicking the image will also reveal the edit icon (an image of a pencil in the top, left) which will open the page to your image editor and you can apply additional changes, as needed. Don’t forget to click the ‘update’ button when you’re finished. Tip: For improved search engine optimization, take time to add ‘alt image text’ in your media edit screen. This will help search engines identify the contents of the image and better interpret the topics of your website pages. Also, avoid using high resolution imagery. Images that exceed 250kb in size can slow down your page loading time. Step 1: Upload the media file that you would like to create a download link for, such as a PDF (or other media file), by accessing your media library (locate the media > add new button in your WordPress dashboard). Step 2: Once you’ve uploaded the PDF or other media file to the image library, you’ll need to find the media file URL. Every image and media file on your website has its own URL (example: yoursite.com/wp-content/uploads/abc123). If you’re using WordPress 4.0.1 or later, you can find this URL just by clicking on the thumbnail in your media library and viewing the attachment details. With older versions of WordPress you may need to first find the image edit screen.When you find the media file URL copy it (CTRL + C or CMD + C). Step 3: Now that you’ve located your media file’s URL and copied it to your clipboard, you can easily link it for downloading from hyper-linked (anchor) text. 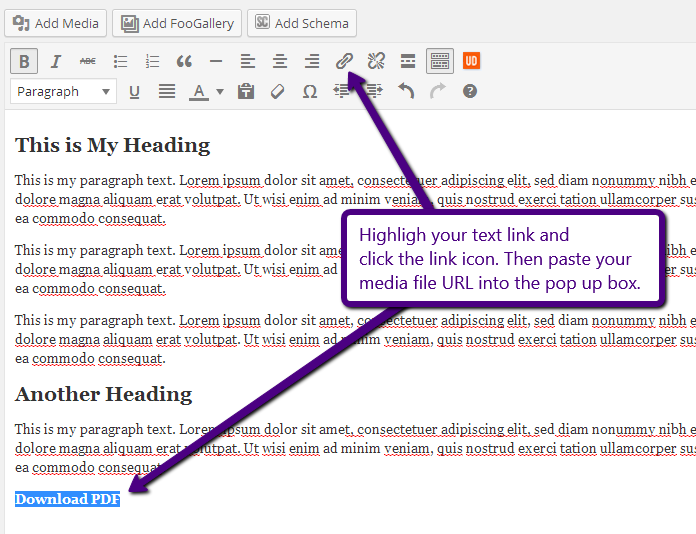 To link a downloadable file from text, simply highlight the text by double-clicking it and then clicking the insert link button on your WordPress content editor toolbar, as shown in the example below. Click ‘update’ to save your changes.